Most of the regulars on our blog know the word cruciverbalist (a crossword aficionado), but probably few are aware that the word was first introduced to the crossword by today's constructor Mel Rosen and Stan Kurzban. 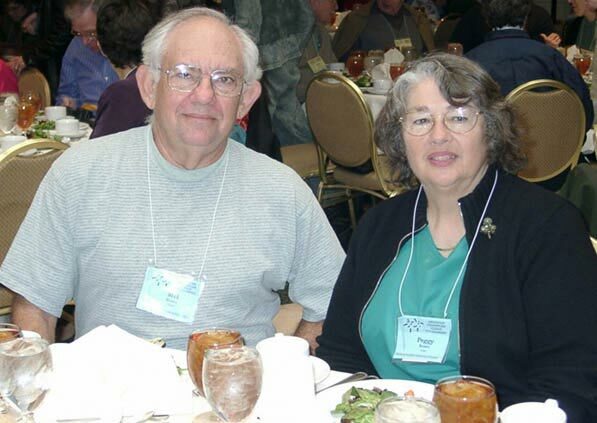 Mel Rosen (His wife Peggy on his left) is author of the book "Random House Puzzlemaker's Handbook". He also served as the puzzle editor of the Crosswords Club, currently headed by our LA Times Daily Crossword editor Rich Norris. Besides the LA Times, Mr. Rosen's puzzles have also appeared in the NY Times, the Wall Street Journal, CrosSynergy, the Washington Post, etc. What is your background and how did you develop an interest in crossword construction? I was a computer programmer for IBM (going back to when the smallest computers were the size of large refrigerators), so there's analytical wiring in my head. My mother taught remedial reading and my father spent Sunday morning solving the puzzles, so words were always important. My wife's parents also enjoyed puzzle solving, so it seemed natural for us to buy and solve puzzle books when we went on vacation. One day it occurred to me that if we paid money to buy the books, maybe the puzzle writers got paid. It was literally that straightforward. The first puzzle I wrote was a Double-Crostic that Thomas Middleton bought(!) for one of his Simon & Schuster collections and the rest, as they say, is history. What is the highlight of your crossword construction career and what's the best puzzle you've made? And why? Highlight? Certainly being asked to be the second puzzle editor for The Crosswords Club, succeeding Will Weng, was right up there. And of course every puzzle is the best. Seriously, I was proud of a tribute to Frannie Hansen for one of John Samson's S&S collections. It emulated her occasional "interview with a..." format. My wife suggested and I wrote a puzzle for the NYT marking Ellen Ripstein's having -- finally! -- won the annual ACPT. That was another good one. Doug Peterson mentioned that your book "Random House Puzzlemaker's Handbook" introduced him to crossword construction. How has the book affected your personal and professional career? That book was a revision and update of an earlier work, "The Compleat Cruciverbalist", written with Stan Kurzban, who devised some very clever diagramless puzzles published by Eugene Maleska. The earlier book, probably more than anything else, brought the word "Cruciverbalist" into the language; it had been coined several years before by a puzzle-constructing priest. Abigail Van Buren cited it in a column. Where do you normally find your crossword muse? What kind of books/magazines/websites do you read for theme inspirations? Anywhere and everywhere. Unlike some constructors, I do not keep a "theme notebook". If I read or hear something that tickles my brain, I'm off to the races. When I was with the CrosSynergy team I was actively looking for material all the time. Now that I'm strictly a free-lancer I can wait for inspiration. I solve three or four online crosswords and three or four online sudoku puzzles every day. (Including those at the LAT sites.) I enjoy too many favorite constructors to single out one or two. And no, I'm not running for office. I play tennis at least once a week. I'm a jazz keyboardist. I sit in every week at a jam session at a local restaurant ... for 15 minutes up to an hour. I'm just finishing up an album for my family and friends. A-ha! I'm not a retiree, I'm a freelancer. Thanx! What an interesting man, with such a profound influence on all puzzle constructors. Will Weng made me aware it was people who made the puzzles; Mr. Rosen and Mr. Kurzban let us all in on the secret. I continue to be impressed at what interesting and diverse people diagram part of our lives. I see a tie between musicians and crossword compiling. Mel and C.C., thanks for sharing another great interview. Hearing from the constructors has personalized the puzzle solving process for me, and increased the enjoyment! Haha - Solvers get a bonus AHA! moment when they first realize that real people with full lives actually create all these puzzles we enjoy! It appears that all constructors are really nice people. At least that's the feeling I've had with every one of C.C. 's interview subjects. They generously share their time and expertise with each other and with their audience ....us. Mel Rosen is no exception to the rule. Thanks, as always to C.C. and thanks to Mel Rosen for the interview and for our word. Thanks to you both for taking time to do this interview. I always enjoy hearing from "the other side." Although I am a list maker,I find it is a lot more rewarding and fun to get going right away with the idea of the moment. Loved your puzzle. Hi, too nice outside to be "inturned". We are appreciating the warm weather sent our way. From what the farmers say we need rain. If they say so, I'll take their opinion. I do own a bumbershoot. Hi, Kazie! Thanks for the interview. Mel Rosen is one of my favorite constructors. The BU is capitalized in Butterfield because it was a telephone number. You dial the BU plus one number then the other four numbers (which is why there were letters on the phone keys, texting was unknown in those days).